Purpose. 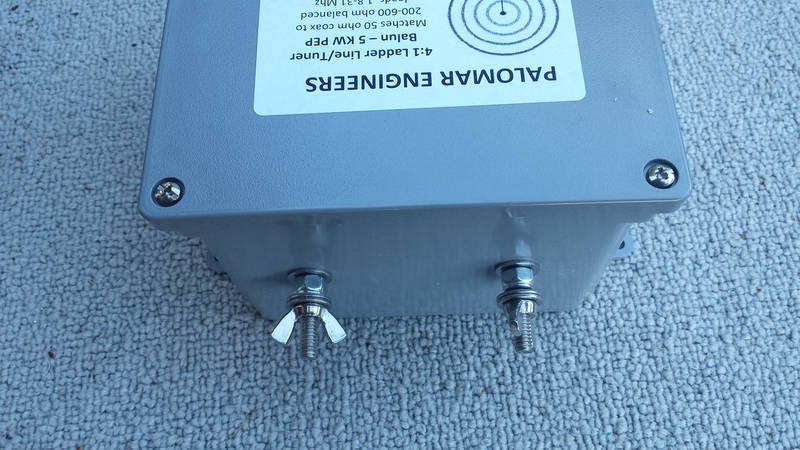 This impedance transformer is set up as a balun (unbalanced coax to balanced 200 ohm output) and is designed to convert from coaxial cable to ladder line up to 5KW PEP from 1.8 to 61 MHz. 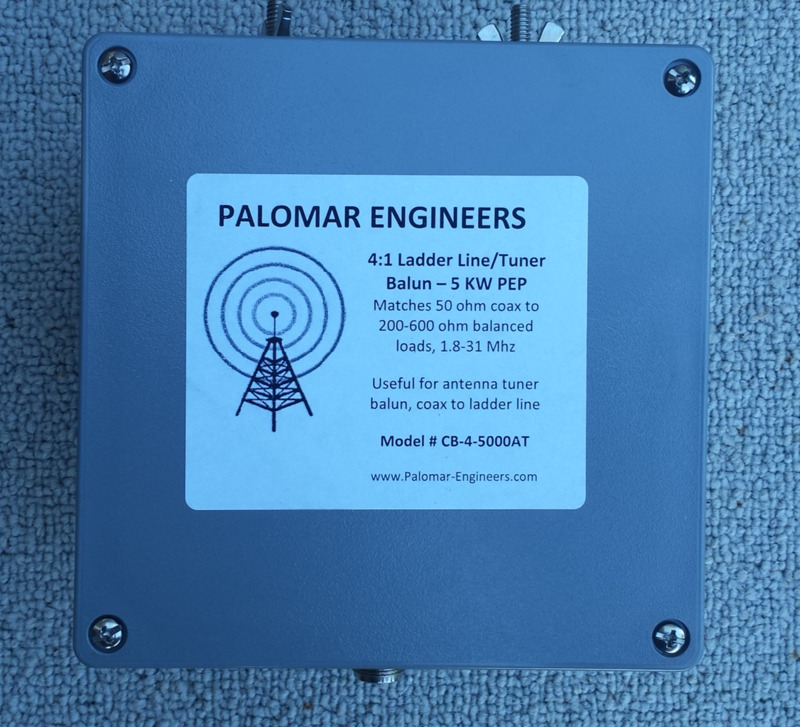 It provides conversion from unbalanced coax to balanced ladder line and gives a 4:1 impedance step-down to reduce impedance seen by the coax, allowing the tuner to easily match the antenna. This impedance transformer consists of multiple cores of ferrite configured as a true current balun giving well balanced currents into each output terminal over a large range and providing a 4:1 step down from 100 – 600 ohms. The 4:1 conversion ratios give input connector impedances in the range of 17 – 150 ohms for loads of 100 – 600 ohms which yield SWR’s under 3:1 easily managed by most antenna tuners. 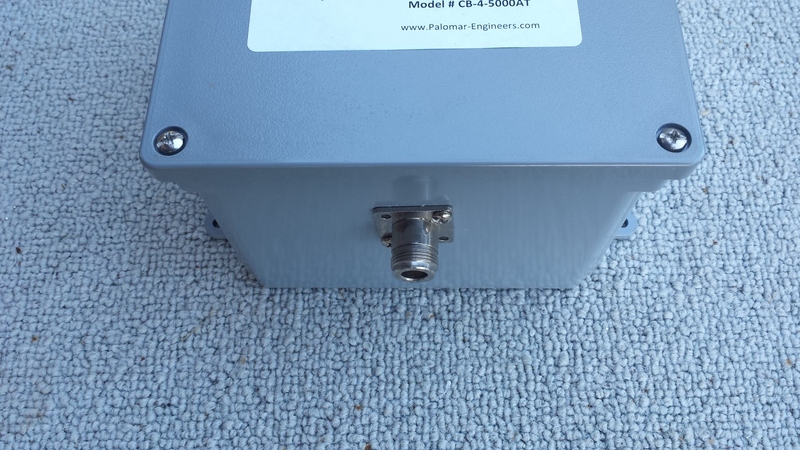 Consider using this balun primarily where brute force, high power capability is needed over a range of output impedances such as a multiband Zepp fed ladder line antenna. Application. A zepp dipole can be used as a multi-band antenna by using an antenna tuner to convert the impedance to 50 ohms for the transmitter. The zepp is usually fed with 300-600 ohm balanced line feeders and, as long as the feed line length is an odd number of 1/8 wavelengths at the fundamental frequency (468/f (MHz), the impedance at then end of the feeders will generally be in the 100-500 ohm range. 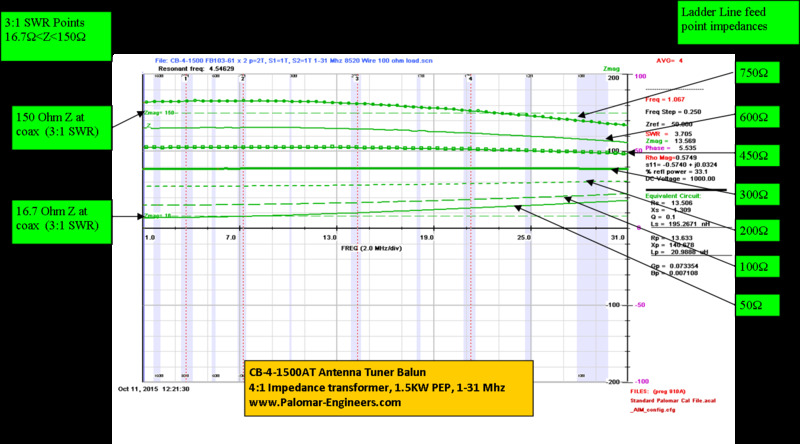 The CB-4-5000AT is designed to operate over a range of 100-600 ohms and convert these ranges to 17-150 ohms impedance which can be easily matched by an antenna tuner at the end of the coax. Coax length from the balun to the antenna tuner should be kept to less than 10 feet due to the potentially high SWR (and coax losses) that may occur on the coax. Of course the ladder line changes the impedance seen at the balun depending on its length. But there still is a wide range of impedances seen from band to band and a very rugged balun, such as the CB-4-5000AT is required to cope with it. The impedance conversion is almost uniform for the 1.8-61 MHz range but is adequate for most tuners to match the transmitter/transceiver. The CB-4-5000AT is best used for ladder line to coax or as an antenna tuner balun for matching a broader range of load impedances. This product is NOT designed to be used with unbalanced outputs – use our 4:1 Unun’s for unbalanced output requirements. For best results use a feed line choke on the coax input to suppress common mode currents. Due to the multiple output options, these items are made to order, please allow 5-10 days shipping time.